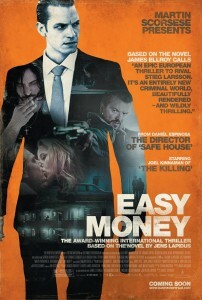 The film Easy Money based on Jens Lapidus's book of the same name was (finally) released in the UK on Friday. Easy Money is the first book in the Stockholm Noir trilogy and the second and third books have also been filmed. The series stars Swedish-American actor Joel Kinnaman, from the US remake of The Killing. Read Laura's review of the book. Thanks for this! I was eventually won over to the US version of "The Killing" by the performances of Mireille Enos and Joel Kinnaman - so I'd be doubly interested to see a different Kinnaman in this...and I see Matias Varela - "Jorge" - from the Arne Dahl TV series is also in the film.